So. Many. Flowers. And. Plants. Wonderful! People, next year you simply must go. Go. GO. It’s like nothing else. So what were my highlights of the day? What did I learn through the experience? To begin with, my big tip for those lucky enough to get a ticket is to be at the gates of the Royal Hospital Chelsea by 7.45am, fifteen minutes before they open. That way you can enjoy the gardens, exhibitions and grand boulevards before it gets too excitingly busy. And if you’re staying in one of London Perfect’s Chelsea apartments, like the Hamilton, Elliot, Fleming or Portland, then it’s only a 5-minute stroll away. Useful gnome with watering can. What’s not to like? 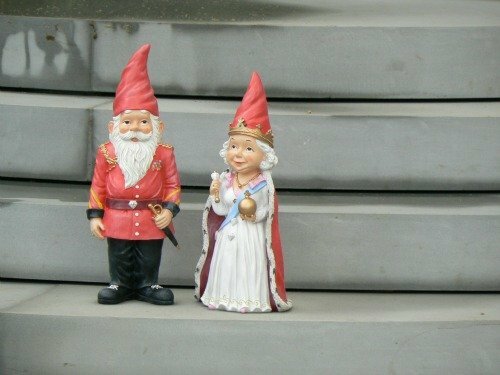 Two royal gnomes enjoying a grand day out. Apologies though. I missed out on the 9ft-tall ones that we somewhere near the main entrance. I was somewhat distracted by excitement and overwhelmed by the beauty of the various gardens on display. 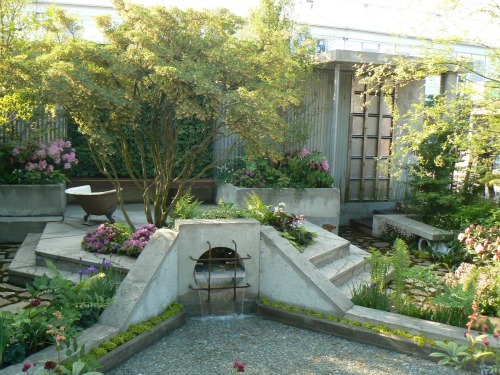 My personal favourite and winner of the Best Show Garden was the Australian offering. This was a massive space designed by the youthful Philip Johnson and was inspired by the billabong-style of his own garden. Lashings of tree ferns, waterfalls, the most spectacular artist’s studio ever as well as a good dollop of Australian flora. It was simply stunning. My next favourite was the clever Wasteland by Kate Gould. 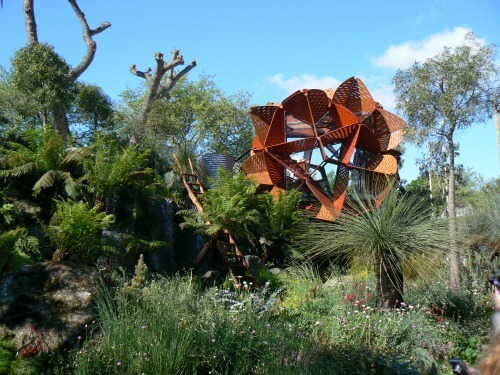 This garden encouraged visitors to rethink the use of concrete and hard rubbish in what one normally considers to be a natural – albeit cultivated nature – space. Think upcycling in your back yard. And I adore the bathtub converted into a garden chair. If you want a space for quiet contemplation and thought provoking issues – like plant quarantine – then the Food and Environment Agency’s garden is for you. Ok, the sponsors might not be the sexiest out there but bear with me. 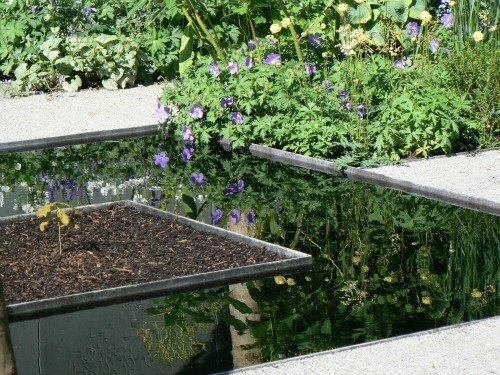 The simplicity of the single oak sapling in a pool was very striking whilst the contrast between the hard, textured sculpture with the surrounding soft wild flowers was stunning. FERA’s garden entitled Stop the Spread. 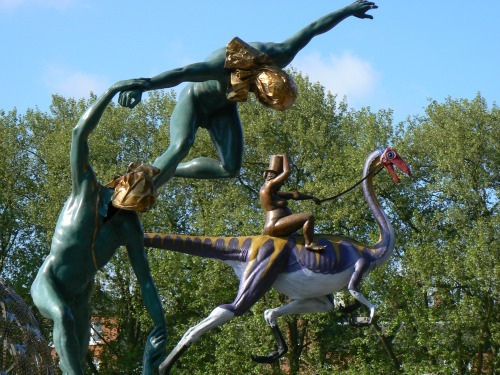 Speaking of sculptures, here are some good ones to consider acquiring if you’ve a garden bigger than a postage stamp. Don’t try and fit either of these on a balcony. Once finished with the delights outdoors it was time to view the offerings of legions of nurserymen and women in the Great Pavilion. This space is large enough to house something like a million double decker buses. Or was it a million hedgehogs? Anyway, it’s a huuuuuge space with an awful lot of plants on display. 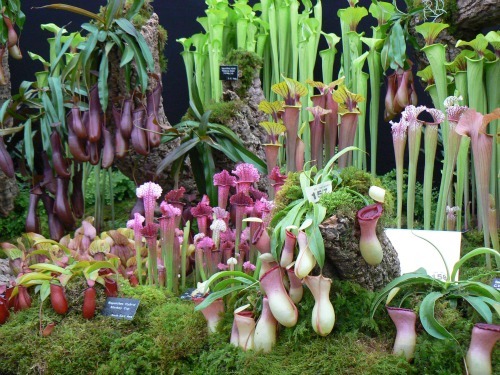 Whatever gives you the greatest delight from carnivorous plants to orchids, roses to strawberries, it was all there. Bug-eating plants. Kinda creepy yet strangely appealing. At last! 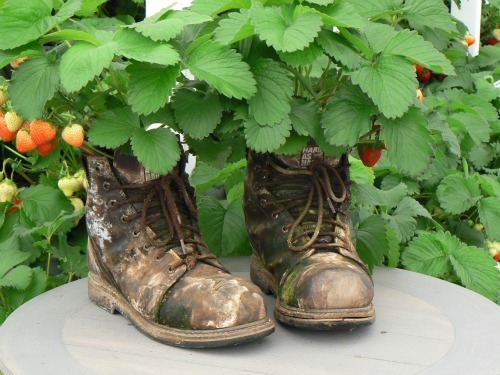 A use for old boots. 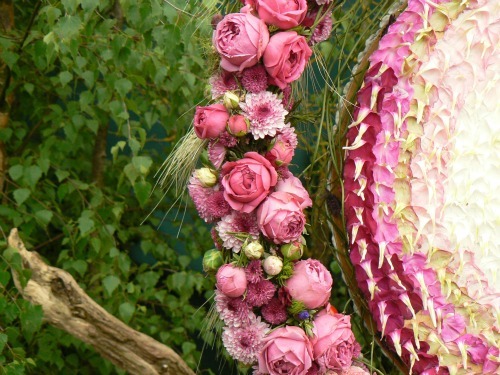 Of particular note were the entries by florists for the RHS Chelsea Florist of the Year, whose brief had clearly involved decorating something circular with a lot of blooms … and to a varied and striking effect. 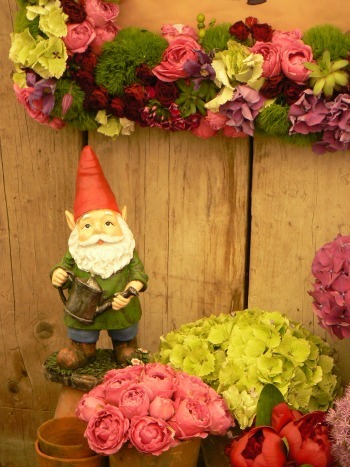 What’s so marvelous about the Chelsea Flower Show is that it’s on in spring time. We’ve the rest of summer to revel in the garden, plotting and planning how our little slice of greenery will fulfill its potential as a paradise on earth. And there’s always space for more inspiration. 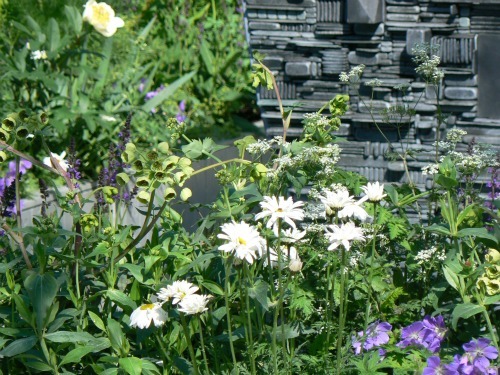 It’s a jolly good thing that the RHS Hampton Court Palace Flower Show (July 9-14) is just around the corner. So hurry up and get some tickets whilst there are a few left! See you there. Photo credits: All photos by Zoë F. Willis. 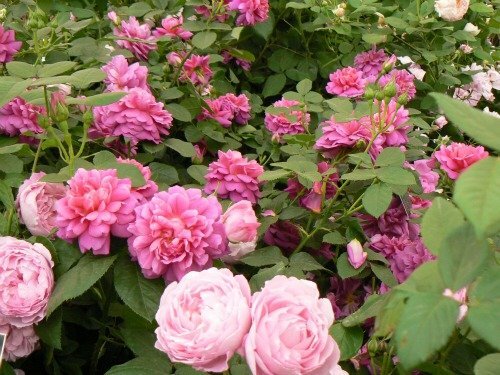 Posted on Saturday, July 6th, 2013 at 10:11 am in See & Do. You can follow any responses to this entry through the RSS 2.0 feed. You can leave a response, or trackback from your own site.